While millennial pink may be on its way out (Pantone’s color of the year is a deep violet, so get ready to start dressing like Prince), the chocolate industry hasn’t gotten the memo. In addition to milk, dark, and white chocolate, cocoa producer Barry Callebaut has developed a fourth variety: ruby. Described as being an “intense sensorial delight,” the chocolate is made from Ruby cocoa bean. The chocolate apparently has a berry, fruity taste and is naturally pink. The new flavor has reportedly been in development for over a decade. 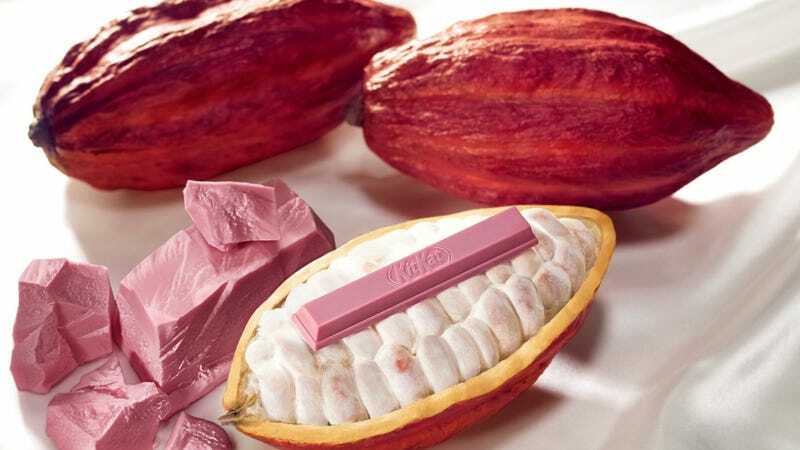 And now South Korea and Japan, the latter being the home of gourmet Kit Kats, will get a taste of the ruby chocolate with Nestle’s fancy new Ruby Kit Kat. They’ll debut around Valentines Day because nothing says true love like fad foods that will get great engagement on Instagram!